I was feeling quite bummed that my husband and I were unable to find a sitter for the Friday or Saturday of Valentine's Day weekend this year. I felt especially left out after Amazon.ca had ranked Saskatoon the 4th most romantic city in Canada! In lieu of a night out, my sweet husband and I decided to attempt a great date night in. . . . and I am proud to say we succeeded! Part of our original plans had included sushi. So instead, my husband made an online order for pick up after work from Nagoya Japanese Restaurant. I took a couple minutes to fluff the hair, put on lipstick and spritz perfume before descending the staircase to our date. My husband was already busy downstairs altering the ambiance from a kid's play zone to an adult retreat space. He had finished picking up the food that had not made it into our children's mouths and was lighting candles. While I put on some music, he began setting things up on the opposite end of the table than we generally eat together. I thought this smallest of moves was brilliant, as it helped to make the meal feel even more different. 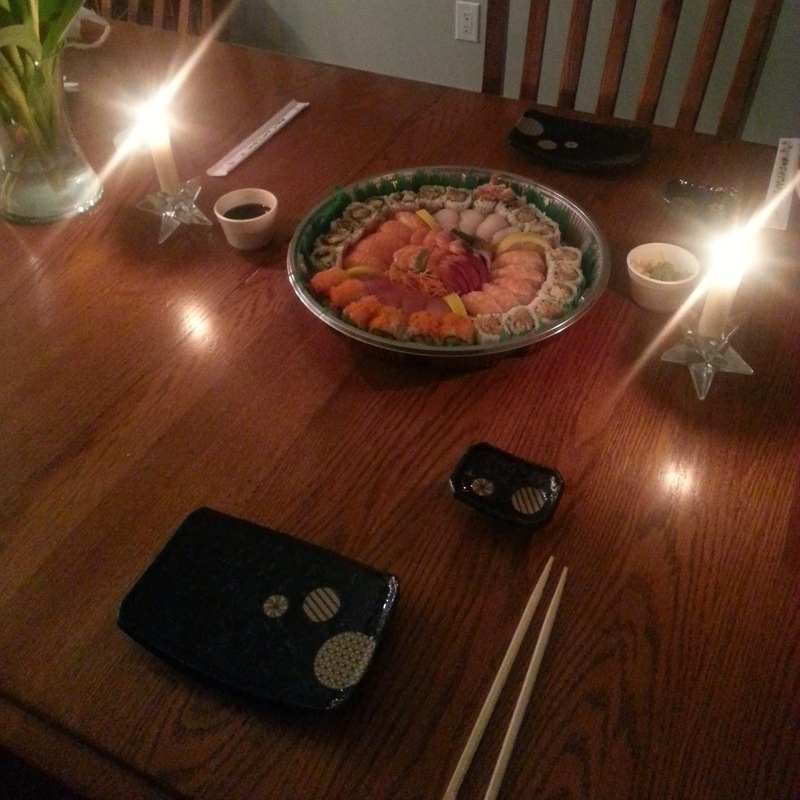 I broke out our cute little sushi set that we received from our wedding almost 10 years ago and these lovely dishes also helped to step up the romance factor for me. 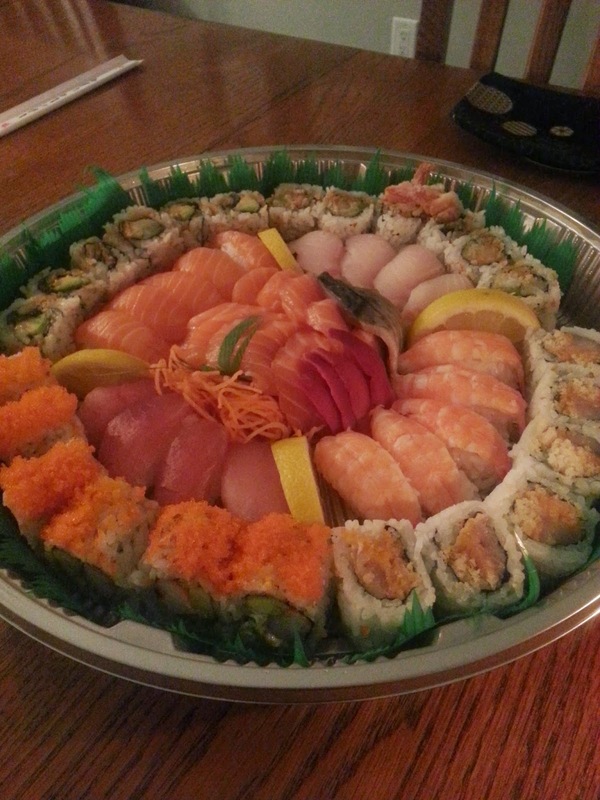 Our Nagoya platter was both beautiful and delicious. It was also not lost on either of us that we would have spent the amount we paid for the 60-piece sushi platter on babysitting alone had we gone out that night. As we chatted and enjoyed our sushi, we both could not stop smiling! It was a wonderful realization, for both of us I think, that we could closely recreate an enjoyable adult dining experience without leaving home. We both agreed our "date night in" was fun. It was a wonderful way to connect while our 6-year-old and 2-year-old slept. It left us feeling inspired to try it again. We already are planning our next "date night in," and I am looking forward to it very much! What are some of the successful "date nights in" you have had or would like to try with your partner?